Few trout patterns are as beautiful as classic wet flies. Learn to tie one of these timeless flies. I believe I am safe in saying that the first fishing flies, although they were fairly simple and unadorned, were elementary wet flies. Our fly tying ancestors constructed these rudimentary patterns by wrapping one or more feathers on hooks fashioned from bone or antler. They fished their flies subsurface and with good results. Although there exists a strong international wet fly–tying fraternity that makes these patterns mostly for the aesthetics and beauty of the flies, fishing wet flies is now looked upon as “old school.” But few fly fishing methods equal the effectiveness of swinging wet flies down- and across-stream through a riffle. This method of fishing has existed for so long because it works so well. This, however, is not an article about the history of fly fishing or fly tying. I want to show you how to tie a wet fly. I also want to share a few tips demonstrating how to make an exceptional-looking pattern. I call the sample fly we will tie the Famous Grouse. Hook: Mustad S60NP, size 10. Tail: A slip clipped from a grouse tail feather. Wing: Slips clipped from two matching grouse wing feathers. Throat hackle: Grouse saddle hackle. Body hackle: Grizzly variant hackle. My son’s first hunting trip, and the beautiful plumage of the female black grouse he shot, inspired me to create the Famous Grouse. My love of old Scottish culture also gave inspiration to this pattern. In this simple tutorial, I have tried to combine as many classic elements as possible to create a British-style wet fly having a tail, flat tinsel body, oval tinsel rib, palmered body hackle, feather-slip wing, cheeks, and throat hackle. The colors are simple, with only the grizzly variant hackle not coming from the female black grouse. These grouse skins are remarkable and contain a vast amount of natural brown, black, and brown-black-white speckled feathers and hackles for making all kinds of flies, from small drys to large streamers. They are the avian equivalent of the hare’s mask! If you do not have a female black grouse skin (how many American tiers have these in their stashes of materials? ), follow the steps using other feathers in earth tones. I know you will create a lovely fly. Barry Clarke is one of our favorite contributors. His flies are first-rate, and his instructional photographs are superb. 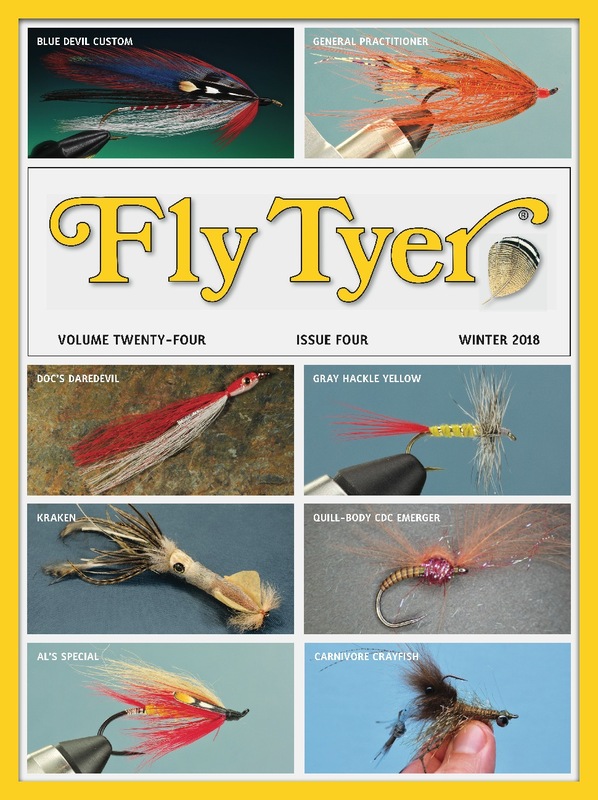 Read his articles, and you will learn how to tie better flies! Barry lives in Norway. If you want to see more of his flies, and a lot of other surprising things, go to his website, www.thefeatherbender.com.